"Out there tonight a lot of little girls and boys are watching. They're watching us. And they're seeing the beginning of something, well, a little bit different," she told a crowd celebrating her victory on Wednesday night. Ms Lightfoot previously led the city's police accountability task force. The body was set up after the death of a 17-year-old named Laquan McDonald at the hands of a police officer in 2014 and subsequent alleged cover-up. 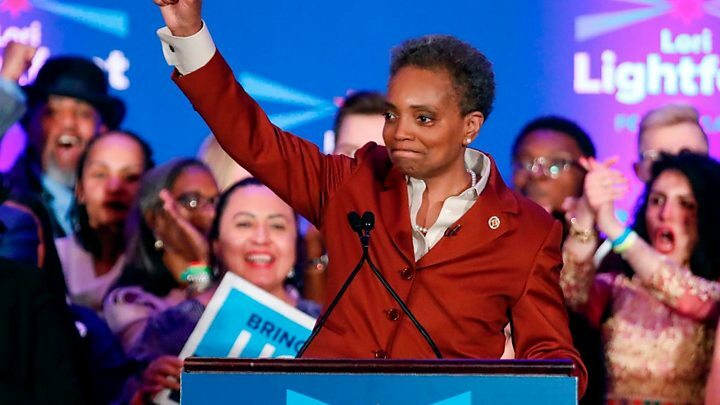 This list includes San Francisco's London Breed, the city's first female mayor since Democratic Senator Dianne Feinstein in 1988, as well as Rochester's Lovely Warren and Washington DC's Muriel Bowser. She has taken an "indefinite leave of absence" to recover from an ongoing bout of pneumonia, but it comes amid an investigation into the sales of her self-published "Healthy Holly" children's book series.